But cricket isn't just about structures, it depends like no other sport on questions of how successful the captain is in motivating and leading his team, and how well different personalities and egos are integrated and managed in the changing room. From Joe Root and Alastair Cook back to Mike Atherton, Mike Brearley and Ray Illingworth, England captains have had a heavy influence on proceedings. Recent debates over Kevin Pietersen were nothing new, as contemporaries of W.G.Grace would doubtless recognise. As England play their 1000th Test, this is a brilliant and unmissable insight into the ups and downs of that story. Review: This book is a detailed history of the England men's cricket team, from the first Test Match against Australia in 1877 to the start of the 2018 English cricket season. As may be expected, this is a vast undertaking; during this period 684 different players represented England in Test Cricket, with several more having played in One Day International matches since their addition to the international calendar in 1971. It is much to Simon Wilde's credit that he has managed to achieve this in a comprehensive volume some 600 pages long. 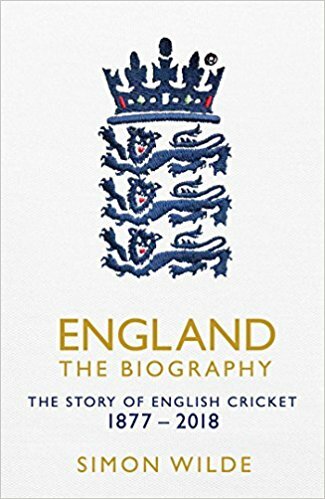 The book's chapters, arranged chronologically, cover various aspects of the England cricket set up. Initially, the England cricket team was run by a private club, the Marylebone Cricket Club, or MCC, which did not relinquish the management of England's overseas tours until 1968. Other chapters cover, among other things, the division, until 1962, of players into amateurs and professionals; new countries achieving Test Match status; neutral umpires; television rights; and the rise of One Day cricket. There is a small statistical section at the end of each chapter and a final, comprehensive statistical appendix at the end of the book. This book, by its very nature, is quite dry and does not purport to be a humorous account, such that by Henry Blofeld, for example. Also, I sometimes found it difficult to follow since the narrative does have a tendency to jump between different seasons. However, it does provide a very comprehensive account. As an enthusiast who has watched the England cricket team play on a number of occasions since 1966, I found the book a fascinating read, and enjoyed the accounts of various characters such as WG Grace, and of events such as the the Bodyline tour of Australia in 1932-33 and the effect of the Kerry Packer revolution in the 1970s on cricketers' earnings and television coverage of matches.